In a dark nameless corner of the world existed twelve weapons so powerful they disrupted the very fabric of space in the dimensional vortex. Their source was the twelve spirits of chagrin. The rare powers they possess have left them without happiness, detached from reality, and disgraced having given up all loyalties. All these spirits will hear are the voices of the strong. They search for them. For those who are just, and full of integrity. In responding to their call, one must stand unshaking. The twelve weapons can only be ascertained by those able to do so. To access the Chamber of Arms, go the Farplane and enter the King Mog's castle. Head straight to a door to the north, below the stairs to the King's chamber. Head straight to the Chamber of Arms. Once you've accessed the Chamber of Arms, the shortcut will be available from the home menu, Vortex > Nemeses. Unlike regular battles, the battles in the Chamber of Arms uses up to 10 units called swap battle. Before battle you can gear up and place your units. This party setup is unique and isn't shared with the rest of the game. They will be saved to any Chamber of Arms battle you do. Up to 5 units can act at any given turn, called attack units. The rest of the units are reserved as backup units. Friend companion can't be used in battle. You can't bring a duplicate of the same unit. You may swap between any units from attack and backup units freely by clicking on the swap button and dragging the unit to your desired team, and clicking the confirm button. Once any action is performed, the swap button is greyed out and you can no longer swap until the next turn. Singing will count as an action and will lock up swap button until the turn they finished singing. You can swap out KO'd attack units to backup units, but you can't bring any KO'd backup units back as attack units. If your entire attack units are KO'd in a turn, they would be automatically swapped to the remaining backup units. Units in backup are frozen in time, any buff or debuff timer will not tick until they perform an action as attack units. You can't use items in battle. The added rating is unofficial and might not reflect accurately. The chamber of the Sealed Weapons in FFV. Chamber of Arms is based on the Sealed Weapons (伝説の12の武器, lit. "12 Legendary Weapons") found in Final Fantasy V. They are legendary weapons used to defeat the necromancer Enuo a thousand years ago. After Enuo's defeat the weapons were sealed inside Kuza, the Sealed Castle. 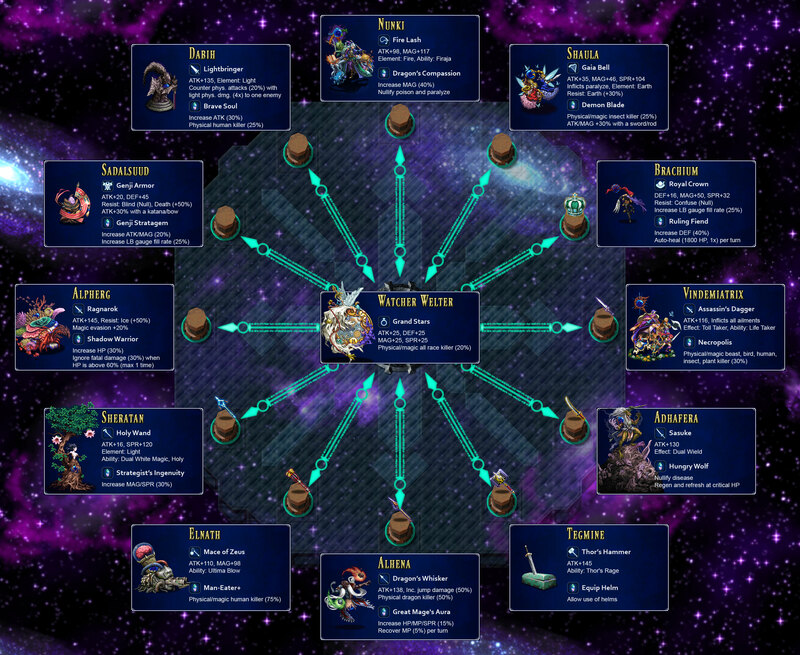 When Exdeath merges the two worlds by shattering the Crystals, the two halves of the Sealed Tome also reunite, giving Bartz and the other heroes information on where to find the Tablets that can unseal the weapons and use them to defeat Exdeath. There are four Tablets scattered throughout the world. Each Tablet can unseal three sealed weapons of your choosing. Sheratan, the proper name of Beta Arietis, is a star in the constellation of Aries. Elnath, the proper name of Beta Tauri, is the second-brightest star in the constellation of Taurus. Alhena, the proper name of Gamma Geminorum, is the third-brightest star in the constellation of Gemini. Tegmine, the proper name of Zeta Cancri A, is part of a multiple star system in the constellation of Cancer. Aldhafera, the proper name of Zeta Leonis, is a third-brightest star in the constellation of Leo. Vindemiatrix, the proper name of Epsilon Virginis, is a star in constellation of Virgo. Brachium, the proper name of Sigma Librae, is a binary star in the constellation of Libra. Shaula, the proper name of Lambda Scorpii, is the second-brightest star in the constellation of Scorpius. Nunki, the proper name of Sigma Sagittarii, is the second-brightest star in the constellation of Sagittarius. Dabih, the proper name of Beta¹ Capricorni, is part of a multiple star system in the constellation of Capricornus. Sadalsuud, the proper name of Beta Aquarii, is the brightest star in the constellation of Aquarius. Alpherg, the proper name of Eta Piscium, is the brightest star in the constellation of Pisces. All trial bosses can be seen holding a blue orb containing stars from the constellation they are a part of. This page was last edited on 19 March 2019, at 10:57.